Baobab Press, LLC., 9781936097241, 380pp. 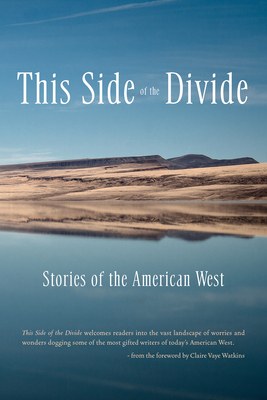 From Baobab Press, in coordination with the University of Nevada, Reno's Master of Fine Arts in Creative Writing program, comes This Side of the Divide: Stories, the first anthology in a literary series attempting to capture the newness, vastness, territoriality and sense of transience alive in the American West. Set west of the Continental Divide, these narratives skillfully demonstrate the beauty, austerity, and danger of the untouched wilderness, delight in the mutual ease and asphyxiation of the hyper-urban and chart the interstitial spaces of the developing and the abandoned. Inhabiting the West's richly varied landscapes, the characters in these stories provide a glimpse of the social and cultural diversity on display in these regions. Among these 15 stories, gathered from rising literary voices, a single mother struggles to maintain her individuality while raising an autistic son; a cathartic hike brings an unsuspecting widow face-to-face with her own mortality; a man injured in a train wreck questions his existence as he blindly wanders the desert; an aging cowboy rides the highways astride his magnificent horse, a final remnant of a fleeting era; Sasquatch looks for love in all the wrong places; and a divorcee tries to reconcile her present with her past, her heart with her head. Positioning the voices of emerging authors alongside acclaimed writers such as Tobias Wolff, Brian Evenson and Nona Caspers, these collected stories, at turns hilarious, frightening, and devastating, showcase the variety of identity, amalgam of voice and depth of character that make the American West such a truly brilliant, literary mosaic. Contributors include Tobias Wolff, Maile Meloy, Brian Evenson, Melinda Moustakis, Nona Caspers, Douglas W. Milliken, David Gillette, Miranda Schmidt, Michelle Willms, Andrea Lani, Leah Griesmann, Vanessa Hua, Cathy Warner, Mark Maynard, Aharon Levy, Sian Griffiths, L.L. Madrid, Kirk Wilson, Ashley Davidson, Carl Beideman, E.G. Willy, Shelley Blanton-Stroud, and Linda Lenhoff. Baobab Press believes in the importance of collaboration between author and publisher. We seek to establish long-term relationships with our authors, providing them with the support necessary to see their works of art-no matter how divergent in content, style, and form-reach their fullest potential and widest readership. Our goal is to help our authors grow books that resonate today and will continue to be vital in the years to come. Baobab Press shares the Levy Mansion with Sundance Books and Music, in Reno, Nevada. Our books are distributed by Publishers Group West.